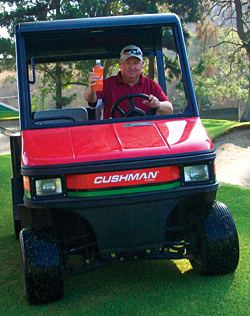 The Cushman Turf-Truckster features a payload of 2,850 pounds, and steel or poly dumping beds are available. Transmission choices include an automatic, three-speed option, a dash-mounted shifter for an automatic, four-speed transmission, or a five-speed manual option. The vehicle features a 32-horsepower, electronic-fuel-injection gas engine, and a 24.8-horsepower, diesel engine is available. Auxiliary hydraulics are standard, and an optional high-output system is available.